Well what a busy weekend! Had my mother-in-law, Pauline, with us for the weekend as she is moving from Luton up to Rushden into an assisted living apartment – a big upheaval for an 80 year old! Anyway, we toddled off to the Hollowell Steam Rally and Heavy Horse show, mainly because she adores horses and also because I wanted to photo’s of them. Let me tell you, pushing a wheelchair up and down those hills gives you muscles on muscles. I could have a rant (as my friend Sue would say in her blog) here about the number of people who moaned about the fact that we had taken a wheelchair to the event! But I was a good girl and just thought at them that they should be grateful that they don’t have to use one. Anyway got some good horse shots for future paintings and some wonderful shots of owls and falcons. Heres a (rather grainy) shot of Shadow – I have tweaked the colour of his eyes a little as they were a little too green before. When you look at the group shot you can see that there’s now a difference between Spirit and Shadow. 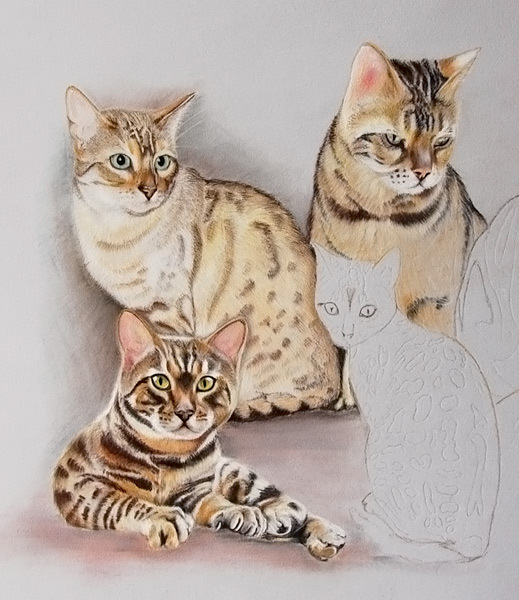 Still need a little more work, but that will come once I have all the cats finished. 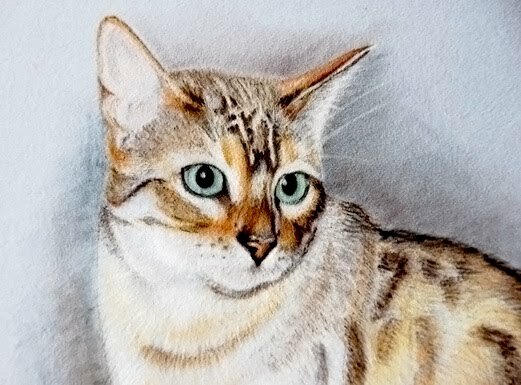 I started adding more body colour to Inca and defining the markings on his head, then strengthening the darks. Again, Inca has lovely markings and wonderful flecks of light over the dark. 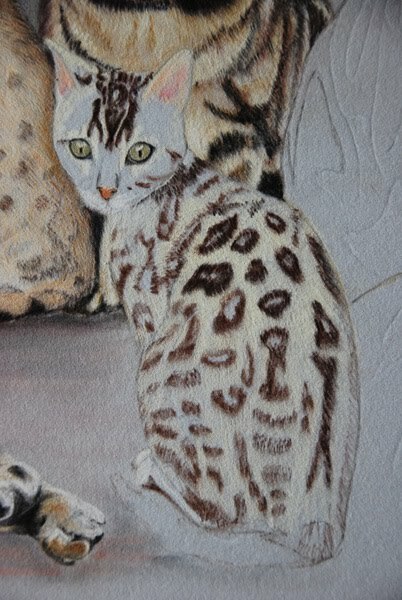 You can just see in the last shot that I had started adding undercolour to the kitten, Carminah, too. I definately want to place a toy in that space between her and Spirit as she has that mischeivious look in her eye! So while you look at the group shot so far, I’m off to raid Amber’s toy basket! 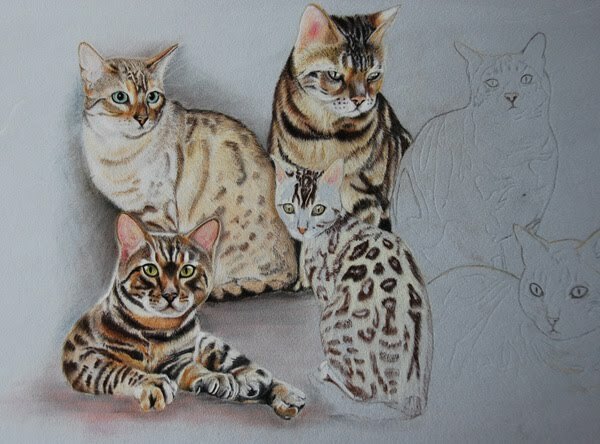 Next update planned for Tues or Wed.
Love this, beautiful painting cannot wait to see it finished, I was so excited to see all these fabulous Bengals, I've only got one (Maisie) and my sister has her brother Sid, so I am a great fan of the breed.